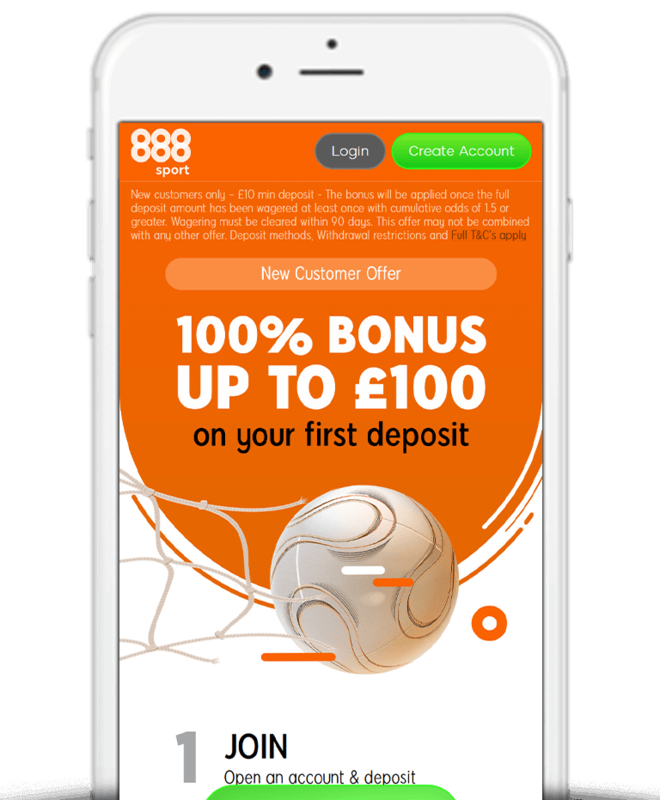 In this article we detail all you need to know about the 888Sport deposit bonus offer including a step-by-step guide on how to claim the promotion as well as the key terms you should know about. T&C’s apply. In addition to their Bet £10 Get £30 and treble odds offers, 888Sport have a THIRD introductory promotion which works in the form of a deposit bonus. What Is The 888Sport Deposit Bonus Offer? Open an account (no promotion code necessary) and deposit a minimum of £10. 888Sport will then match your deposit up-to a maximum of £100. For example, deposit £100 and have £200 to play with. Your bonus will be applied once your full deposit amount has been wagered at least once on bets with cumulative odds of 1.5 (1/2) or greater. Firstly, click here to head to the 888Sport deposit bonus offer landing page. 888Sport will then match your deposit with a 100% bonus. That’s right, we’ve teamed up with 888Sport to offer followers of ThePuntersPage.com a completely free no-strings-attached £10 free bet as well as the customary deposit bonus offer. There are a number of terms you should be aware of regarding 888Sport’s deposit bonus offer. We’ve detailed the main ones below although you can find the full T&C’s on the 888Sport website. Customers must deposit a minimum of £10. Wagering must be cleared within 60 days. In terms of welcome offers, this is one of the biggest out there. With that in mind, for those of you who class yourselves as ‘high rollers’, this is the perfect way to get started.